The former Republic Airlines (IATA: RC, ICAO: REP, and Callsign: Republic)was an airline formed on 1 July 1979 by the merger of North Central Airlines and Southern Airways. In 1980, following its buyout of Hughes Airwest, Republic became the largest airline in the United States by destinations served. On January 23, 1986, Northwest Airlines, flying since 1947 under the name Northwest Orient, announced that it would purchase Republic for $884 million; the merger was completed on October 1. Republic operated hubs in Minneapolis-St.Paul, Detroit, and Memphis: these airports are now the backbone of Northwest's domestic route network. On the day of the merger, Northwest dropped the "Northwest Orient" brand name and returned to its pre-1947 name, Northwest Airlines. Despite Northwest's ongoing efforts to remove all remaining presence of any Republic-branded imagery, as of 2005 it is still possible to find a few old Republic logos around Minneapolis-Saint Paul International Airport and Memphis International Airport if one looks hard enough. The current Republic Airlines (IATA: RW, ICAO: RPA, and Callsign: Brickyard) is a regional airline subsidiary of Republic Airways Holdings that operates service as US Airways Express for US Airways from Philadelphia and Washington National using Embraer 170 aircraft. US Airways' pilots previously had a "scope clause" prohibiting the airline from operating large regional jets such as the 170. The airline negotiated around this clause by offering flight deck jobs to laid-off US Airways pilots, in a program known as "Jets for Jobs." 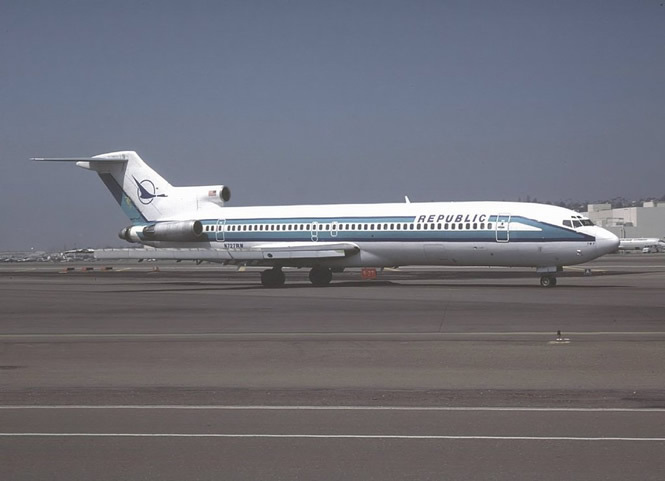 This agreement created a subsidiary, MidAtlantic Airways. However, as part of the airline's bankruptcy restructuring, the 25 E170s delivered to MidAtlantic are being transferred to Republic, which will operate them along with three new-delivery aircraft on order. Republic will operate them under a conventional Express carrier contract.